In January 1920, the Ecumenical Patriarchate issued an encyclical “Unto the Churches of Christ everywhere,” calling for the “rapprochement between the various Christian Churches” and the establishment of a “League of Churches” (echoing the words of the Patriarchal Locum Tenens the previous July). Even more radically, the encyclical called on “the churches” (making no distinction between Orthodox and heterodox) to “no more consider one another as strangers and foreigners, but as relatives, and as being part of the household of Christ and ‘fellow heirs, members of the same body and partakers of the promise of God in Christ.’” By treating the heterodox as also being “members of the same body” as the Orthodox, the Ecumenical Patriarchate inaugurated a new era in “ecumenical” relations. Meanwhile, in the wake of Britain’s Balfour Declaration and the rise of Zionism, Jewish migration to Palestine was on the rise. This led to conflicts with the native Palestinian population, and, in April, to the Nebi Musa riots in Jerusalem. Nearby, in Syria, the Syrian Congress proclaimed an independent Arab Kingdom of Syria in March, with King Faisal as the monarch. The British and French immediately rejected this, and in April, the League of Nations established the French mandate for Syria, giving France control over the region. Patriarch Gregory of Antioch threw his support behind King Faisal and swore allegiance to him. But facing a superior French army with the backing of the League of Nations, King Faisal surrendered in July. On July 24, French troops entered Damascus and declared the Syrian Kingdom to be disbanded. Soon, Syria – and thus the core territory of the Patriarchate of Antioch – was divided by the French into three entities: Syria, Lebanon, and Hatay (after they failed in their attempt to also carve out Alawite and Druze states). This division was damaging to the Patriarchate, which had its population relatively evenly distributed between the three new states. In June, the Orthodox jurisdictions in Yugoslavia were united into a single Serbian Orthodox Church. In November, Metropolitan Dimitrije of Belgrade was elected Patriarch. The Serbs began negotiating with the Ecumenical Patriarchate for recognition of their autocephaly, and one of the topics discussed in those negotiations was clergy remarriage. Bishop Nicholaj Velimirovic – author of the Prologue from Ochrid collection of saints’ lives, and later canonized a saint himself – was a leading figure in these negotiations for the Serbian side, and was reportedly an advocate of clergy remarriage. In August, royalist soldiers failed in an attempt to assassinate the Greek Prime Minister Venizelos. Two months later, King Alexander died of blood poisoning caused by a monkey bite. This occurred only days before the next round of elections, in November, which turned into a referendum on the monarchy. The Venizelist faction was defeated, and the exiled King Constantine – who had abdicated back in 1918 – was recalled to Greece. After this, other countries declared their neutrality in the Greco-Turkish War, leaving Greece isolated. With his ally Venizelos defeated, Archbishop Meletios Metaxakis was no longer welcome in Athens; however, he was conveniently in the United States at the time, in the process of organizing the Greek Archdiocese of America. While all this was happening, on November 8, the great wonderworking bishop, St. Nektarios of Aegina, died of prostate cancer. Three days before St. Nektarios’ death, in Turkey, the future St. Iakovos of Evia was born. His first five years of life were filled with turmoil – his father was taken captive by the Turks before Iakovos turned two, and then his family was forced to leave their homeland as part of the “population exchange” between Greece and Turkey. Also in November, the exiled Russian Metropolitan Antonii Khrapovitskii and numerous other bishops arrived in Istanbul. On November 19, aboard a ship, they held the first meeting of what was then called the Higher Church Administration Abroad – what eventually became known as the Russian Orthodox Church Outside of Russia (ROCOR). 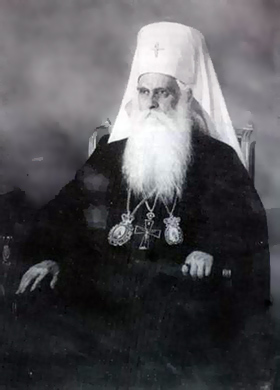 According to some sources – although this is disputed by others – the following day, Patriarch Tikhon formally granted permission for ROCOR to be organized. What isn’t disputed is that, on December 2, the Locum Tenens of the Ecumenical Patriarchate authorized the exiled Russian bishops to establish “a temporary committee under the authority of the Ecumenical Patriarchate” to administer the Russian Orthodox communities in exile.